Choosing a wall paint color to coordinate with your furnishings is important to the overall appearance of the room. This is a guide about choosing a paint color to coordinate red and black furniture. I have a black leather contemporary sofa and a crimson red chair in my living room. My ceiling is an exposed concrete gray. Any ideas/suggestions on what color should I paint my walls (they are currently white)? Thanks. What else is in room you want to keep? How about art work colors, are those the only two colors? Take inventory of all colors, and try to imagine one as wall color, as is, or lighter, or darker. Grays are always good with red and black, but that doesn't feel right to me. Soft green/gray? What shade of red is it you have? Any pillows, throws that contribute color? Leather of any kind is very masculine. Then with the red chair that is dominant I would go with a denim blue or any blue muted color. I painted the main wall a "warm caramel" and now I want to paint the rest of the house. I have black tables and a red sofa and a oversized chair. Any ideas? You mentioned the "rest" of the house; is this in your front room area? Do you want your entire house to be the same color? If so: go with a neutral perhaps "sand" for the caramel perhaps; off white if always nice as well; I would go to the paint section of various stores: and choose which appeals to you personally; then take home and try next to the "wall" and try to envision what it would look like done in that color. The reason that I recommend you go to various stores, is that they carry different tints and colors. What you see in one store, will not be what you see in another! Get a good selection of choices, and then go with the one that you love the best. You will be living there! Good luck! (I am doing this same thing in my bedroom!) Have not come to a definite conclusion yet! Go about 3 shades lighter on the other walls and maybe another shade of caramel on an accent wall where the tv or fire place are to emphasize the area. Don't forget wall paper is back in also, this would add some texture to the room also. Good luck! I have contemporary leather/stainless steel furniture. I have a black couch and love seat, a red sofa, red rug, and red and black accents. What color should I paint my walls? It depends on the color red you used. 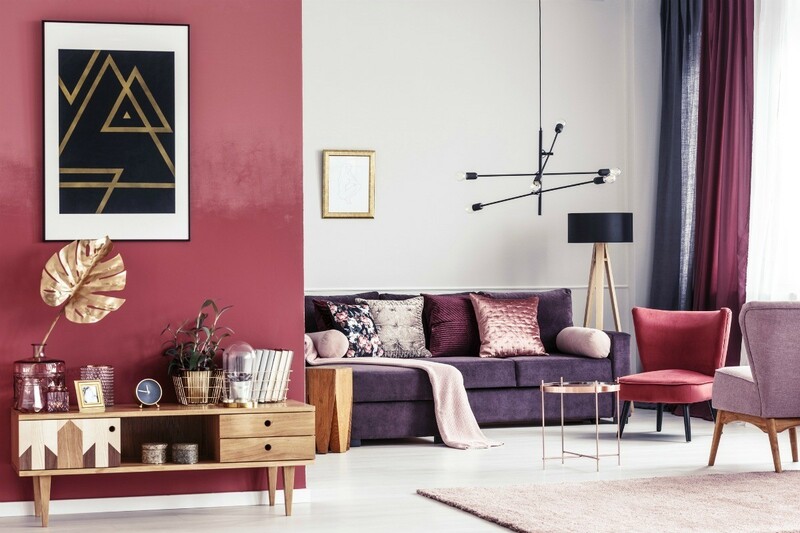 Usually, if you used a really dark red/maroon color, a light tan or coffee brown will accent the furniture well, and if you used a bright red, a slightly darker tan/brown will do. You want to avoid greens, since it will give the room a Christmas-y feel, and with the stainless steel and black leather, tans/brown make a nice backdrop. If you want more color in the room, find a paint chip sample that is close to your furniture colors, and then compare those to different paint chips, and use whatever color you like for trims or borders. You can find artwork that has your reds in it, and use that to add color and personality to the room too. If you choose to do stripes or borders, and you think that you might someday move, choose more neutral colors, so it will be easier to sell as is, or it will be easier to re-paint later.